It’s on a third-tier American cable channel that half of the country doesn’t get. They’re coming off a six-week fresh program layoff, and hadn’t recorded new material in nearly four months (not counting Bound For Glory, which is still three months old). By the estimates of anyone who knows Impact Wrestling inside and out (read: anyone with a Twitter account, not to mention fingers), the company should be dead by now. Yet TNA managed to secure a new cable home, Discovery offshoot Destination America, just before Thanksgiving, and has re-signed pretty much every performer of relevance save for Bully Ray. Tapings continued this week, beginning with a live broadcast Wednesday night from the Hammerstein Ballroom in New York City. If you like omens, the literal ECW held its final pay-per-view, Guilty as Charged, on January 7, 2001, precisely fourteen years earlier in the same building. It’s worth noting that the ECW influence that TNA appropriated over the summer was completely absent. For once, the default number two promotion in North America stood mostly on its own two feet. There was plenty of good to be had from the Destination America premiere of Impact, and a share of bad as well. Here’s a primer on where the company sits after one show on its new home. GOOD: Things were happening in the opening, and they were good things! For once, TNA felt like a happening place to be! A stylized intro saw the entire roster making their way toward the venue, mentally preparing themselves for the night ahead. That’s a nice touch, given how often TNA has devalued its own product to kneel at the altar of someone like Hulk Hogan or Kurt Angle or Sting or whatever aging former World Champion shows up this month. Bobby Roode, the reigning champion, drew the most focus along with the Hardy Boyz, Gail Kim, and MVP’s crew. Not a bad start, especially from a production standpoint. The video was on par with anything WWE or UFC would do for hype, and probably emptied Dixie’s pocket a bit. Worth the coins, I think. To conclude the video, both sides of the roster erupted in a brawl just outside the Ballroom and then, in real time, the fight spilled into the actual arena! Samoa Joe pounded DJ Zema in the front row while a host of other wrestlers battled in the Ballroom’s balcony. Even the Knockouts were involved in the skirmish. Why were they fighting? Who cares? I’d rather a horde of endorphin-spiking wrestlers brawl at the drop of a hat than see a handful of top babyfaces get fired by the evil boss and just stand there like a sad mannequin. If the criticism against Raw is the lack of action, then Impact at least delivered in that regard. A tremendous ten minutes to open the night. Someone should clue in the censors at Destination America, who are apparently more hyper-sensitive than an eyeball to a chisel lodged in it, that sometimes wrestling crowds will chant naughty, naughty things. In the opening bit, a chant of “SHUT THE F–K UP” directed at MVP was partially censored by some lifeless drone timing the mutes with the F-bombs. The mutes were excessive to the point that MVP’s promo sounded like an airing of Pulp Fiction on ABC Family. Tell em to relax their asses a tad. 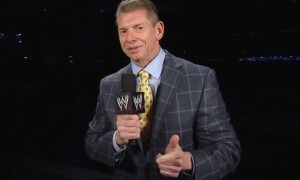 I figured even Michael Cole with a mouthful of Good-n-Plentys would be an upgrade over Mike Tenay, who for twelve years ranged from “trying to parlay the wrestling historian shtick unsuccessfully into a lead role” to “poor man’s Jim Ross” to “disinterested to the point where Taz could probably draw on him with a Sharpie during most broadcasts.” Tenay needed to be removed from the booth, I opined, and I figured Taz as well. Replacing Tenay is Josh Mathews, a man 26 years younger, with over a decade experience in WWE on headset (mostly B-shows). 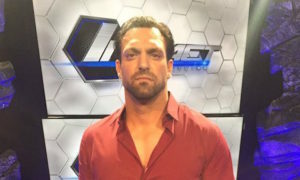 Mathews appeared earnest in his first TNA outing, and never grated on the ears. Sometimes his enthusiasm didn’t exactly sell the magnitude of what was happening (a criticism of most announcers, really), but at least he was focused on the action at hand. That’s another criticism against WWE that TNA, at least for one night, avoided falling into. While I didn’t get my wish of Matt Striker to upgrade the color commentator’s chair, Taz was a pleasant surprise. It seems like it’s been forever since I heard the “Human Suplex Machine” so lively, on-point, and knowledgeable in his call. Either the time off sharpened his focus, or Mathews is his ideal partner, or both. Whatever the case is, I found the call to be enjoyable. BAD: Quick, onto something else! While the change in announcing will go a little ways in extinguishing the mustiness of TNA’s worst days, the TV production needs to break some old habits. Austin Aries had barely celebrated with the X Division Title before the cameras cut to the next bit TNA wanted to get across. One thing WWE has infinitely done better is let moments sink in before going to commercial or fading to black. Tenay’s scream of “TO THE BACK” was like a twist and a turn on a roller coaster you don’t remember getting on. I realize TNA has some limitations on time (we’ll get to that later), but if they feel what they’re presenting is important, they need to let the dust settle before moving on. The great production piece to open the show, as I said, probably was a hit to TNA’s wallet. To off-set that a smidge, the low-quality backstage vignettes still exist. Here’s MVP and Kenny King conspiring with the graininess of a 1992 America’s Funniest Videos entry. Whatever happened to a good-old-fashioned one-question interview in front of a set-piece? Mike Tenay, as I mentioned, was ill-equipped to try and be TNA’s Jim Ross, given the highness of his voice and lack of authorative gravitas. In spite of the qualities the he, not to mention you and I and billions of others, lack, he’s still a well-schooled historian in the art and history of wrestling. Tenay vacated the commentary chair to take a new role, a bit of an invesigative journalist for a secondary program called Impact Wrestling: Unlocked that will air on Saturdays on Destination America. In a preview, we got Tenay interviewing James “Bray? Who’s Bray?” Storm in a character-building piece. I’m okay with all this; as I mentioned, a big TNA knock from two points ago is that nothing sinks in. Needing a weekend show to explain everything that should be sinking in during prime time might be excessive, but it’s a leap forward, and a suitable role for Tenay. As a side note, I think Tenay would be fine as the one-question interviewer from the last point, since Tenay’s skeptical grimace is hard to duplicate. Wouldn’t you wanna see Tenay scrunch his face up while Robbie E claims he’s the one that dumped Brooke? I know, me too. The Destination America logo bug on the right hand of the screen could double as a to-scale replica of Comiskey Park. If it were any more distracting to the viewer, the viewer would be oblivious to any and all outside interference behind him. Get a trimmer and shave that thing down. If you don’t count Jessie Godderz jumping on the apron in the Knockouts battle royal, then three of the five matches Wednesday night went without interference. That’s a 60 percent clean rate! Are we sure this is TNA? Of the two matches that *did* feature screwy outcomes, one was pretty excessive (more on this later), while the other was in the Tag Team Title match. James “Why yes, I guess I am a little Husky” Storm and Abyss defended against The Wolves in a decent little match that ended with a Storm pin on Eddie Edwards, following a miscue from Jeff Hardy. Hardy was at ringside with brother Matt, and headed off interference from Storm’s other lackeys Sanada and Manik. At least it wasn’t convoluted, right? The Wolves and Hardys (Hardyz? Is the extreme-Z still a thing?) face off on next week’s Impact, so the plan is either just a simple feud with the two teams, or a three-way rivalry for the belts. The ending didn’t make anyone look pitifully stupid and given TNA’s track record, this counts as progress. Ethan Carter III has come a long way from being secondary-show chum in WWE as Derrick Bateman. The character is wonderfully self-absorbed and smarmy, and is one of the better examples of TNA taking a WWE write-off and actually getting good mileage out of him. Paired with bodyguard Tyrus (a non-dancing Brodus Clay) and the act is a sustainable heel bit. EC3’s use on Wednesday was to beat down diminutive former toady Rockstar Spud, and then go after Jeremy Borash (conducting the in-ring bit) for intervening. Carter shaved off part of Borash’s hair to punctuate the angle. A feud between Carter and Borash has no desirable payoff, unless the idea is to have Carter continuously bully ‘little’ people until someone puts him in his place. Then alright. Beyond that, Carter struggled a bit with his live promo, and it ended up one of the lower points of the night. He’s done far better, but judging the angle as a standalone, it didn’t click. The January 4, 2010 Impact was derided for the debut/return of a million has-beens. Five years later, there was only one notable return on the Impact reboot: Awesome Kong, well removed from her blink-and-you-missed-it WWE stay as Kharma. The New York fans freaked out as the monstrous former Knockouts Champion stared down Havok, with the lure of Monster Female vs. Monster Female looking rather enticing. BAD: Commercial break, or infomercial break? One major gripe against Destination America, aside from the aforementioned lot: commercials feel like they’re WAY too long. If the breaks are shorter than four minutes, I’d be surprised. I’ve seen enough “Kate Plus Eight” and “Treehouse Masters” commercials in two hours hate everyone involved. Now I know how John Gosselin feels. Aries regained the X Division Title over Low Ki in a fairly brisk (seven or eight minute) match that hit all of the important notes, and gives us a fresh champion for the reboot. To my way of thinking, Aries is one of the closest things in wrestling to CM Punk: a credible performer capable of working various styles and match-types, with an authentic swagger, and he carries himself like a main eventer. If any TNA performer could be air-lifted and dropped into WWE’s upper card scene today, without being unwelcome or looking out of place, it’s Aries. He was the right man three years ago to halt Bobby Roode’s endless run as TNA World Champion (in a near five-star match to boot), and he’s a great keystone for rebuilding the company. He’s not a WWE reject, he’s not an aging has-been, and his body of work speaks for itself. Aries is the best they have. The World Title match, hyped throughout the night as Bobby Roode vs. Bobby Lashley, Part III, ends with runs ins from a heel brigade of MVP, Kenny King, Samoa Joe (who initially interfered in disguise), Low Ki (ditto), and a heel-turning Eric Young. It’s a lot to digest in the 60-second span that this all happened in. Heel stables and sudden turns have been played out by the company, one that’s had difficulty establishing who their faces and heels actually are. I suppose with a reboot, it’s a bit more permissible to re-establish everyone, but just don’t overdo the specialness of turns and groups as you’ve done in the past. The phrase, “the match was great until the ending” is a staple of TNA’s troubled history, and it emphatically ended the first show in the new home. It’s also ammo for the fans that want to ignore anything good that TNA does, with one glaringly bad/annoying instance to rip apart. While most Raws these days feel like vacant-stared death marches into oblivion, Impact actually brough feistiness and and excitement to the table, with as noted a lot of good and a lot of bad. At this point, given a choice, I’ll check out the show that actually tries. They may be pulling out of the same old worn bag of tricks, but eh, at least they’re fumbling for the gimmicks with actual vigor.